At last I got to the top of my public library’s waitlist for Malcolm Gladwell’s David and Goliath – so I finally had the chance this week to read the entire book. The impression that I came away with was: this is not a good book. It starts out promisingly by using the story of David and Goliath to introduce the idea of the triumph of the underdog. 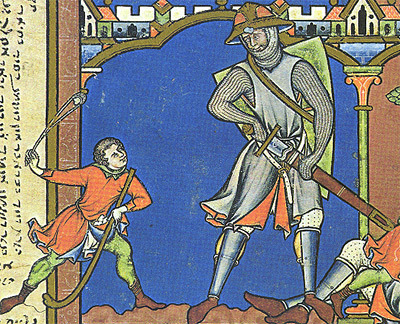 However, the narrative gets into trouble almost immediately by then extensively analyzing the Biblical description of David and Goliath’s battle. This is problematic not only because there’s no definitive proof that the event happened as the Bible describes it – which makes it difficult, for example, to argue convincingly that Goliath lost because of his physical limitations – but because this lengthy diversion derails the energy and flow of the overall narrative. The book then moves on to a series of examples which purportedly demonstrate how underdogs are able to succeed. However, these too are problematic. Other commentators have pointed out the factual inaccuracies in such areas as Gladwell’s discussions of dyslexia and of the Troubles in Northern Ireland. And despite Gladwell’s protestations that he’s just a storyteller, that doesn’t absolve him of the responsibility to get his facts right. However, I think there’s also a larger structural problem with the book, in that the examples don’t really hang together. Some examples clearly relate to the metaphor of David and Goliath, such as the girls’ basketball team that used unusual strategies to beat much more experienced teams. But other examples are less about underdogs and more about unexpected outcomes – and many of the outcomes aren’t that unexpected, no matter how much Gladwell tries to spin them that way. It’s not surprising that very wealthy parents might struggle to get their children, who have never been poor, to understand the importance of being careful with money. It’s also not surprising that crime rates may drop when police officers don’t just arrest criminals, but also give them social support and assistance in finding job and educational opportunities. It’s just not clear what Gladwell is getting at with the book as a whole, and I found that frustrating. It’s good to be reminded that the expected outcome doesn’t always happen – but that isn’t exactly a new idea, and Gladwell‘s examples and analysis don’t really add anything innovative or different. If our comrades, whose only fault is to be born in another religion, received the order to let themselves be deported, or even examined, they would disobey the order received, and we would try to hide them as best we could. We have Jews. You’re not getting them. When I read this passage, the tone and wording of the last line seemed very different from the rest of the letter. So I looked online and found several sources, such as this one, describing the letter and containing that last full paragraph – but none of them contain that last line. Why this discrepancy? One possibility is that the last line is a Jonah Lehrer-like addition to punch up the impact of the letter. Another is that the last line is not part of the actual text of the letter, but is instead Gladwell’s characterization of the letter’s implicit message – and hopefully that’s the correct reason. But if that is the reason, the line should have been placed in a separate paragraph with spacing between it and the quoted text, or been italicized, or been presented in some other way that clearly indicated it wasn’t part of the letter. A noticeable discrepancy like this going uncorrected only adds to the impression of David and Goliath as clumsily assembled and, ultimately, an unsatisfying read. Thanks for the heads-up. I don’t think I’ll have time to read any more of Gladwell’s books.